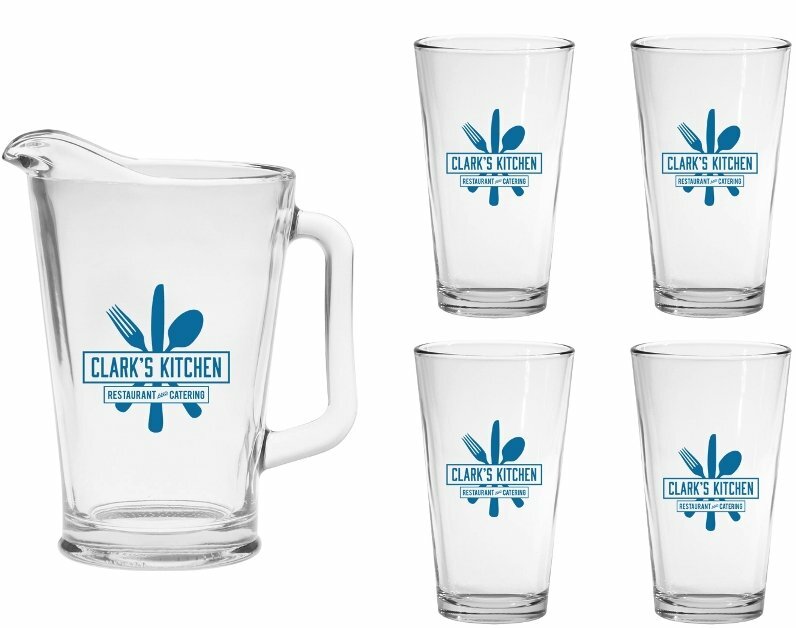 Serve up your logo in this Deluxe Pitcher & Pint Gift Set at the lowest cost possible. a 60 oz. heavyweight glass pitcher with a logo imprinted on all five items. This glassware gift set is packaged in box suitable for gift wrapping. You MUST order the glassware set in whole cartons of 6 units. SafePack Cartons required add $7.00 per 6 unit carton. Price includes one color imprint on each glass in area 3" w x 4" h and. a one color ONLY imprint one side of pitcher 3 3/4" w x 3 3/4" h.
imprint color add a setup & a run charge $2.90 each set. 4CP Imprint available on the glasses ONLY .